I find designing invites a lot of fun. It's a chance to explore colours and themes I wouldn't normally experiment within my own illustrations. I'm usually not a big fan of maroon, but it works so well with the country theme of the card. 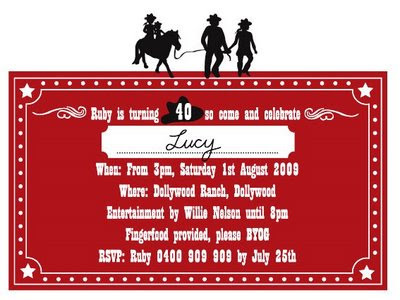 This invite was for a friend who lives in the bush on a farm. Her oldest daughter, who is 3, goes to pony club on her minature horse Elly. Her dad leads her around the obstacle course and jumps. It is lovely to watch tiny pony and tiny girl being dragged around by a very proud dad. Elly is hilarious looking as her bleached mane and tail give her the appearance of Tiny Turner in her Mad Max Days of Thunder days. So for the card I did a little family portrait with Elly included. Hi Diane, love the invite. I've been trying to find your email as I have a pass it forward pack for you....from err quite a few months ago actually, any way if you go to www.ekkocreatives.com.au could contact me there?